The estimated residential population of the Cairns urban area in 2015 was 147,993. Based on 2015 data, the associated local government area has experienced an average annual growth rate of 2.3% over the last 10 years. Cairns is a popular tourist destination because of its tropical climate and access to the Great Barrier Reef, one of the seven natural wonders of the world. In 1770, James Cook mapped the future site of Cairns, naming it Trinity Bay. Closer investigation by several official expeditions 100 years later established its potential for development into a port. Cairns was founded in 1876, hastened by the need to export gold discovered on the tablelands to the west of the inlet. The site was predominantly mangrove swamps and sand ridges. Labourers gradually cleared the swamps, and the sand ridges were filled with dried mud, sawdust from local sawmills, and ballast from a quarry at Edge Hill. Debris from the construction of a railway to Herberton on the Atherton Tableland, a project which started in 1886, was also used. The railway opened up land later used for agriculture on the lowlands (sugar cane, corn, rice, bananas, pineapples), and for fruit and dairy production on the Tableland. 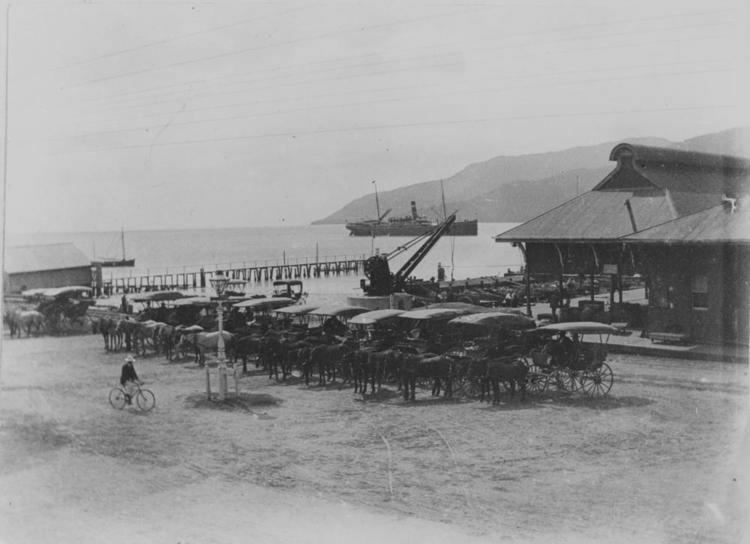 The success of local agriculture helped establish Cairns as a port, and the creation of a harbour board in 1906 supported its economic future. On 25 April 1926 (ANZAC Day), the Cairns Sailors and Soldiers War Memorial was unveiled by Alexander Frederick Draper, the mayor of the City of Cairns. During World War II, the Allied Forces used Cairns as a staging base for operations in the Pacific, with US Army Air Force and Royal Australian Air Force operational bases (now the airport), as well as a major military seaplane base in Trinity Inlet, and US Navy and Royal Australian Navy bases near the current wharf. Combat missions were flown out of Cairns in support of the Battle of the Coral Sea in 1942. Edmonton and White Rock south of Cairns were major military supply areas and US Paratroopers trained at Gordonvale and the Goldsborough Valley. Cairns experiences a tropical climate, specifically a tropical monsoon climate (Am) under the Köppen climate classification. A wet season with heavy monsoonal downpours runs from November to May, with a relatively dry season from June to October, though light showers can occur during this period. Cairns' mean annual rainfall is just over 2,000 millimetres (79 in), although monthly totals in the wet season (Dec-Mar) can exceed 1,000 mm (39 in), with the highest rainfall being recorded in any month in January 1981, where over 1,417.4 mm (55.80 in) of rain fell. Babinda, a town to the south of the city, is one of Australia's wettest towns, recording an annual rainfall of over 4,200 mm (170 in). Cairns has hot, humid summers and milder temperatures in winter. Mean maximum temperatures vary from 25.7 °C (78.3 °F) in July to 31.5 °C (88.7 °F) in January. Monsoonal activity during the wet season occasionally causes major flooding of the Barron and Mulgrave Rivers, cutting off road and rail access to the city. Cairns has 89.7 clear days, annually. Dewpoint in the wet season (summer) averages at 23 °C (73 °F). The average temperature of the sea ranges from 23.8 °C (74.8 °F) in July to 29.4 °C (84.9 °F) in January. Cairns has three representatives in the Queensland Parliament, from the electoral districts of Barron River, Cairns and Mulgrave. The city is represented in the Federal Parliament by representatives elected from the districts of Leichhardt and Kennedy. Tourism plays a major part in the Cairns economy. According to Tourism Australia, the Cairns region is the fourth-most-popular destination for international tourists in Australia after Sydney, Melbourne and Brisbane. While the city does not rank amongst Australia's top 10 destinations for domestic tourism, it attracts a significant number of Australian holiday makers despite its distance from major capitals. There is also a growing interest in Cairns from the Chinese leisure market with occasional direct flights from Chinese cities such as Shanghai and Guangzhou. During the 2013 Chinese Lunar New Year period alone, Cairns saw 20,000 Chinese holidaymakers flying in on chartered flights. The city is near the Great Barrier Reef, the Wet Tropics of Queensland, and the Atherton Tableland. Several shopping centres of various sizes are located throughout Cairns. The largest of these are Cairns Central shopping centre, located in the central business district, and Stockland Cairns, located in the suburb of Earlville. In Westcourt, one of the city's oldest shopping centres has been refurbished, with the city's first DFO. To service the needs of suburbs further from the city centre, shopping complexes are also located at Mount Sheridan, Redlynch, Smithfield, and Clifton Beach. The Bruce Highway runs for 1,700 km (1,056 mi) from Brisbane, and terminates in the Cairns CBD. From there the Captain Cook Highway (also referred to as the Cook Highway) commences, and runs for approximately 76 km (47 mi) northwest to Mossman. A public transport network is operated throughout the city by Marlin Coast Sunbus. A transit mall is located in the CBD, through which all services operate. Services include most parts of the city, from Palm Cove in the north, to Gordonvale in the south. Bus services operated by 'TRANSLink' run to Kuranda and to the Atherton Tableland. A smaller minibus service, Jon's Kuranda Bus runs between Cairns and Kuranda. Cairns also has one major taxi company, Cairns Taxis, which services the Cairns region. Cairns railway station is the terminus for Queensland's North Coast railway line, which follows the eastern seaboard from Brisbane. Services are operated by Queensland Rail (QR). In April 2009, the high-speed tilt train service from Brisbane to Cairns was suspended due to safety concerns but resumed service on 4 May. Freight trains also operate along the route, with a QR Freight handling facility located at Portsmith. The use of the existing heavy rail line for commuter services between Redlynch and Gordonvale is occasionally discussed; however, this is not a favoured option under the FNQ 2010 Regional Plan, which recommends the use of buses. Cairns International Airport is 7 km (4 mi) north of Cairns City between the CBD and the Northern Beaches. The Cairns Hospital is situated on the Cairns Esplanade and is the major hospital for the Cape York Peninsula Region. The smaller Cairns Private Hospital is located nearby. A new building due to be completed in 2015 will provide up to 168 more beds.